Last week I found two more kinds of pre-made, done for you veggie noodles at the grocery store! Always a happy day when I can come home with easy, fast and healthy ingredients. The newest veggie noodles in my refrigerator now are made from : beets and sweet potatoes. I certainly could use my spiralizer on these veggies, but since they are a little more course and dense, it's much easier to just grab a container of them! I made up this salad just the other day when I wanted a quick lunch full of nutrients and a little protein! Just layer this all up on your plate so it looks beautiful, I sprinkled some pink himalayan sea salt on my eggs and it was ready to go! 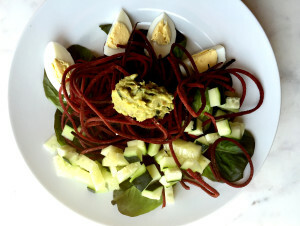 You can also lightly steam or sautee your beet noodles, but they honestly were so delicious raw, just a little hint of a sweet flavor that paired perfectly with the crisp cucumbers! This is a perfect summer salad, especially on warmer days. Try this variation for a new way to use beets that doesn't even involve your oven! 6 Ways to prep for healthy travel!